Almost since 5G first grabbed the industry's attention, US telcos have been crowing about their investment in the next-generation mobile standard. And, rightly or wrongly, an impression has taken hold that America is a frontrunner in the 5G race. 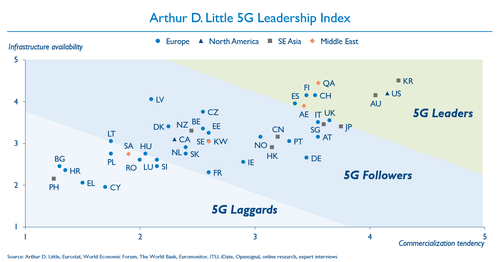 Only this week, a report from Arthur D. Little, a respected consultancy, ranked the US just behind South Korea in its new 5G country leadership index (see below). Other commentators point to major equipment deals for Ericsson and Nokia, and enthusiastic announcements about 5G launches, as evidence of the US position. But it's all just marketing flimflam, according to one of the UK's top executives involved in the rollout of 5G technology. 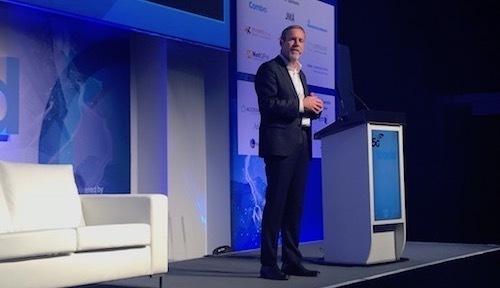 Light Reading spoke with Scott Petty, the chief technology officer of Vodafone UK, on the sidelines of a press briefing in London this week, and his verdict on claims of US 5G leadership was damning. "Only the Chinese are ahead of the UK. The US is miles behind," Petty told Light Reading. "They are making it up. They are rebadging 4G Evolution as 5G." This would seem like chest-thumping for the UK telecom sector were it not for the fact that US boasts have never quite made sense. For one thing, the 5G equipment vendor that just about every non-US telecom executive thinks of as the world's best -- China's Huawei -- is effectively barred from doing business with the main US operators. Elsewhere, even telcos ripping out Huawei's equipment, or promising not to use its 5G products, rank it ahead of Ericsson and Nokia. How can a country that excludes the world's "only true 5G vendor," in the words of BT's Neil McRae, be a 5G leader? Second, US operators have suboptimal spectrum, as the FCC has recognized. Most of the US attention has been on so-called millimeter wave spectrum, which is great for high-speed services but dire for coverage. A nationwide 5G network based on these frequencies would require gazillions of basestations. Low-band spectrum at the other end of the scale is also available, but this brings the opposite problem: superb coverage with sluggish speeds. What the US really needs is more of the mid-band spectrum going on sale in Europe and other regions. This should combine decent propagation with high-speed connectivity. In the US, however, it is locked up for use by satellite companies, and its reallocation is unlikely to happen fast. Happy to lash out at European authorities over spectrum issues, Ericsson and Nokia have had little to say on the US matter because it has not been a barrier to business. In the absence of Huawei, both companies have been landing juicy 5G contracts with the big telcos. That leaves them with no incentive to complain about the spectrum situation in a country whose current administration easily takes umbrage, especially when the criticism comes from foreigners. Third, 5G is still not here. Days after the industry journeyed into the parallel universe of Mobile World Congress, where 5G was ubiquitous, it is back in the real world of testing and deployment. The network hardware might be ready. The software is definitely not, according to Petty. So-called "general availability" is unlikely before June or July, he says. The vendor that will get there first? Huawei. Scott Petty, Vodafone UK's chief technology officer, shown here speaking at an Informa conference in London last year. The network is just one half of the equation, though. Until smartphones arrive, 5G will be as useful as a motorway in a world without cars. Devices shown off at MWC will not go on sale to the general public for several months. The mass-market availability of a decent range of 5G handsets is not expected until late 2019, at the soonest. Even in South Korea, Arthur D. Little's 5G champion, the push for an early March launch seems to have run into problems: Reports this week say commercial services will probably not appear before April because of smartphone delays. US punters may have been fooled otherwise by AT&T's rapid deployment of the "5G Evolution" expression in its marketing. While this could be taken to mean an especially advanced species of mobile service, it stands in relation to 5G like the Neanderthals did to homo sapiens. "Trying to create a perception they are in a better place than they really are," is Petty's take on the broader US 5G claims. In fairness to the US, a country can still be more "5G-ready" than others, regardless of marketing overextension. But there is little to indicate the US is better prepared than the UK. If all goes to plan, both countries will launch real as opposed to fake 5G this year. Vodafone UK has already installed 5G antennas in major cities and hooked these up to an optical fiber transmission system based on the latest principles of software-defined networking. Bridling at suggestions of a UK lag, Petty also points out that Vodafone has been working on virtualization for about four years. "Cloud-native" is now in his lexicon. Such transformative technologies will be needed for more revolutionary 5G services in industrial markets. But the "Release 16" 5G standard that underpins these services is not yet finalized, and no readier in the US than it is in the UK. Petty is not the only UK telco executive willing to knock his US peers. Even if AT&T has led the development of cloud-native technologies, its efforts are unlikely to have paid off, according to Dave Salam, the director of mobility and analytics for BT's EE mobile subsidiary. "AT&T has done this quite early but I'm not sure anyone has saved money out of that approach," he recently told Light Reading. "We chose to delay for Release 16 to get the right functionality and maturity and have the technology in the right way to stitch elements together." As customers of Huawei, both UK operators have reason to be angry with the US. Arguing the Chinese vendor is a threat to national security, US officials have been urging allies to exclude it from their 5G markets. Doing that would cost Vodafone "hundreds of millions" and slow down 5G deployment "very significantly," Petty warned reporters this week. Geopolitically, the main casualties of the US war on Huawei could be the UK and other European countries using Chinese 5G equipment. A conspiracy theorist might think the US is out to hobble Europe. Never has a network technology been so politicized. The US government seems terrified China will gain economic advantage if it takes the lead in 5G. And it already has, says Petty. "They are way ahead on deployment. Their economic system makes it easier to do something. They give away spectrum. They don't have the same planning challenges." 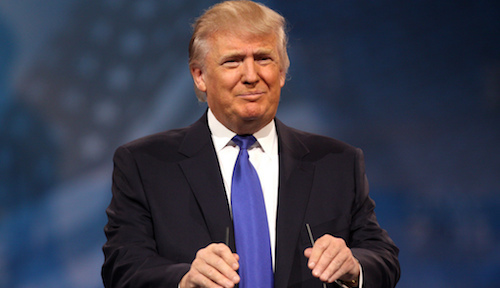 US President Donald Trump has recently waded into the debate surrounding mobile technology. Donald Trump seemed to betray US fears in a couple of typically bizarre tweets last month. "I want 5G, and even 6G, technology in the United States as soon as possible," he tapped. "It is far more powerful, faster, and smarter than the current standard. American companies must step up their efforts." Former presidential candidate Newt Gingrich is equally worried, resurrecting calls for a nationalized 5G network to combat the US lag. Whether that lag is real or not, the threat of state intervention could explain why US operators are such overzealous 5G marketeers. Vodafone's Petty is obviously not buying their story. But nor is Gingrich. "Our incumbent carriers are moving too slowly on 5G, content to deceptively rebrand their existing networks as suddenly '5G,' rather than deploy the networks of the future," he wrote last month on the Fox News website. If he is right, and 5G makes good on its promise, the US could be in tech trouble. The 5G War that Isn't... or 'the Trumped up War on China'. Being a citizen of the USA and industry analyst that worked on the early stages of MIMO OFDMA based mobile networks (WiFi, WiMAX, 4G/4G-Advanced, 5G), I witnessed the demise of Motorola, Nortel and all other attempts of US suppliers of mobile network equipment at the hands of Nokia Networks and Ericsson several years ago. I also saw the rise of Huawei from a small, mainland Chinese supplier doing about $5 billion in annual sales, most of which was network routers, to the leading supplier of 4G and likely 5G networks. The '5G war with China' would be amusing if it were not a part of a much more systemic, long-lasting problem for those living in the USA. The US made no concerted effort to mainline 4G-5G+ development similar to China. The result is that we cannot begin wars in markets we do not compete. 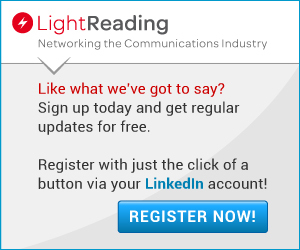 The UK has pursued the use of higher frequency bands, shared access licensing, and other precepts for what is part of building out of 5G networks. While the USA has opened up massive amounts of spectra, we did so without as thoughtful of deliberation of how that can play out to develop a competitive marketplace. As a result, we have a top-sided duopoly that has a greater interest in paying out of dividends to lazy money interests than it does the building of networks, particularly in rural and low-priced tiers of operation. The evolution into 5G is one of extending the universality of the mobile platform, not any single application area. -Advanced does most of what is claimed as 5G until the markets and applications environment evolves over a period of years to require unique capabilities. Having placed all the eggs into the hands of a few companies with profit-taking motivations, the long-term strategic process was left up to the short-term (5-years) aims of the first line consumers of technology, the infrastructure-based operators. Operators depend on the ability to chose their vendors from among the best-of-breed and most cost-effective to suit their near and long-term needs. The Chinese government made wireless technology development among its top five priorities. With only a few exceptions, this did not take the form of subsidies of ZTE, Huawei and other commercial companies. That is because the homeland Chinese market has provided a springboard for sales growth that has far outstripped any other country. Combined with producing more engineers, mathematicians, programmers, and graduates in other fields needed for development, Chinese suppliers benefitted from cheap labor. The time for the USA to have bemoaned the rise of Chinese dominance in 4G-5G was about twenty years ago. Frustrated with the outcome of decades of neglect, the attempt to strike out at the leading Chinese suppliers will backfire. What the US needs are similar thoughtful measures to promote development. However, that does not equate to the US gaining dominance in the 5G supply ecosystem. There is no 'make America Great Again' when there was never a period over the past 20 years when American companies supplied more than 25% of the network equipment. Over the past decade plus, the US has not supplied more than 5% of the equipment used in mobile networks, including sales of Cisco and others. The reaction to the US fear campaign is that it further pits America's allies against areas of cooperation that have promise. There is no valid rationale for the claims that banning Huawei from supplying our allies will result in gains in 5G market leadership. It is so absurd that it is likely to lead to a backlash.